I am so excited that THE LEOPARD WHO CLAIMED A WOLF by Sarah Mäkelä is available now and that I get to share the news! If you haven’t yet heard about this wonderful book by Author Sarah Mäkelä, be sure to check out all the details below. This blitz also includes a giveaway for a $5 Amazon Gift Card and 2 eBooks, International, courtesy of Sarah and Rockstar Book Tours. So if you’d like a chance to win, enter in the Rafflecopter at the bottom of this post. Short of allies, Dougal struggles to balance loyalty and attention between the Pack and Caitlyn. When the Pack’s stability crumbles, he’s faced with the return of his older brother, the rightful Alpha, who shirked his duty after their father’s death. However, Ewan’s challenge will be a battle to the death. Sheltering Caitlyn can only lose Dougal more friends, but he knows she’s the mate he’s longed for. The driveway leading up to the Scottish Pack’s massive headquarters stretched almost half a mile. I rested my chin on my arms and stared out of the Alpha’s window on the second story, overlooking the circular section of the drive. The Pack’s castle came complete with its very own dungeon, but at least they weren’t keeping me in there anymore. The memory of Alistair’s craggy face haunted my dreams each time I closed my eyes. His brutal fists hammered away against my face, ribs, and stomach, until I could no longer sleep. Tension radiated through my shoulders, and I balled my hands into fists. No, Alistair—Colin’s father—was dead. Dougal had protected me, and my brother, from that monster when I didn’t have the strength to fight back. Two days had passed since my brother’s sudden departure. Now Colin was on his own with no one to watch his back. How could he leave without saying anything to me? I flexed my fists again, welcoming the anger as it bubbled up in my chest and replaced my sadness. The heavy weight of a man’s hand descended on my back. I twisted around, my knuckles connecting with a solid jaw lined with dark, coarse stubble. A familiar jaw. Shite. Dougal stumbled back half a step, but then he planted his feet like a tree with strong roots, not budging any further. Sharp power flared outward from him before he squelched it, stretching the muscles in his jaw. A frown tugged at his lips, and the corners of his eyes creased, either in pain or displeasure. “Dougal! I’m so sorry.” The sudden movement of punching him had shot a searing ache through my battered ribs again. The pain stole my breath away, but I tried to force it down. How could I have been so careless? If he’d been anyone else in the Pack, I would’ve caused World War III. He was right, even if I didn’t want to admit it. Waiting for Colin’s return wouldn’t help, but what else could I do? “I know, but that doesn’t make this any easier for me. He’s my younger brother. I feel helpless that I cannae be there for him…again.” A heavy ache settled on my heart, and I pulled away hating the awkward emotions crushing me. Dougal turned away from me and stared out of the window again. His jaw clenched and unclenched, as if he were trying hard to hold in his words. A lot was going on in his life too, and yet he was making a strong effort to support me through my problems. Things had become increasingly strained between him and his Pack since my arrival and Duncan and Alistair’s subsequent deaths. He didn’t talk about what he faced, and I didn’t want to pressure him. I couldn’t help but nod. When I’d awakened from unconsciousness, Dougal had been there for me. We’d made love, and he brought me to new heights of pleasure. We also became intimately acquainted with the fancy Jacuzzi bathtub that could easily fit three or four humans…or one big, scary werewolf. The perks of being mated to the Alpha of the Scottish Pack. “Love, I talked with him.” He trailed his fingertips over my back in light, soothing strokes. “If I weren’t confident that he presented no danger to others, I wouldn’t have let him go. He would’ve stayed here whether he favored the idea or not.” The muscles in his lower back tensed beneath my touch, and his hand paused over my spine. Something didn’t feel right. I lifted my gaze to meet Dougal’s. Was he not telling me something? We hadn’t known each other for long, but my sharp, feline instincts knew when someone spoke an untruth. He wasn’t outright lying, but he was holding something back. What could it be? Without another word, he strode to the en-suite bathroom. His hands clenched and unclenched at his sides all the way. The door snapped shut behind him, and he started the water running a few moments later. Nausea churned inside me, and I held my stomach. Should I believe Dougal? Something about his words didn’t feel right. The Jacuzzi tub would take a few minutes to fill, and I needed to get out of this bloody bedroom and away from him. The strain of standing there and trying to keep myself calm was becoming too much. My stomach growled, and I glanced up at the round wrought-iron clock on the wall. It was almost one o’clock in the afternoon. Many of the werewolves didn’t like that their Alpha was mating with a wereleopard, so I usually skipped the mealtime rushes to keep my distance. It wasn’t easy, because several of the wolves lived here in this honest-to-God castle full time. Apparently, that was how many Packs operated. The thought boggled my mind. How did they stand to be around one another all the time? How would I survive being the sole feline in this house full of wolves? I slid my leather jacket on over the white tank top, not wanting to reveal too much bruised skin, then headed for the kitchen to grab leftovers. Dougal had tried to convince me to eat with him and everyone else. He wanted me to get to know the wolves and socialize. Getting friendly with the Pack might be a nice idea, but I couldn’t do it. Not with how his Pack watched me when they thought I wasn’t looking. Even Dougal’s second-in-command wasn’t a fan of mine. The sentiment was mutual. For as long as I could remember, I’d hated werewolves. One of my main reasons would soon rest six feet underground. Their hatred of me for Alistair’s death just added to my reluctance to get friendly with them. Shaking away those thoughts, I turned the corner to enter the kitchen. If my sharp feline reflexes hadn’t kicked in, I would’ve run straight into a towering werewolf. I leapt back at the last minute to prevent Kerr from spilling his plate of food. The already agonizing ache in my side intensified from moving so fast, but I kept my arms at my sides and my face neutral. “Afternoon, lass. Ye look like yer recoverin’ well.” Kerr nodded, looking curiously at me. “Thanks, Kerr. I’m trying.” I flashed him an uncomfortable smile, then edged past the broad, barrel-chested man into the kitchen. Maybe he wasn’t as bad as the others, but I couldn’t shake the overwhelming feeling that he disagreed with Dougal’s decision to mate with me. Kerr placed a heavy hand on my shoulder. My spine stiffened, and I gripped the sleeves of my jacket to keep from swinging on him too. “Keep tryin’, then.” His deep voice rumbled through the kitchen. I glanced pointedly at his hand, but he didn’t move it. “Sooner or later ye need to overcome yer fear, hatred, or whatever it is ye feel toward my kind. If ye cannae, ye won’t last long here, lass.” With that, he walked down the corridor toward the massive grand hall where the wolves held their meetings and ate. My shoulders slumped. Suddenly, I didn’t feel so hungry, but my leopard still needed to eat. We couldn’t skip any more meals. It hindered our healing process and weakened us too much. Right now, I couldn’t afford weakness, not while I was amongst a pack of wolves. If only I weren’t continually looking over my shoulder with the Pack, but such was life for now. Shite. I didn’t have much time before Dougal noticed I’d left the bedroom. The leftovers were neatly arranged on the clean countertop. There wasn’t much food left, but I grabbed a bag of crisps and one of the last club sandwiches. A female wolf—Mairi, I think—ran a catering company, so she always brought by food to keep the Pack well fed. She was one of the nicer wolves. Instead of following Kerr toward the dining room, where I would probably find the rowdy werewolves laughing and talking, I remained in the kitchen. I sat on the counter farthest away from the entrance, hidden from anyone who might walk past. As I finished my sandwich, footsteps in the hall became louder as someone approached the kitchen. The sound of soft sniffing tensed every muscle in my body, then Dougal stepped into the room. His gaze slid over me, and desire darkened his eyes. I tilted my chin up, not in the mood to be bossed around again. “I’m not alone. You’re here.” I opened the bag of crisps and munched on one. First, I’d been his prisoner in the cage, and now I’d become a prisoner in his bedroom. Not in a fun way, either. Why was this happening? I clenched my fists, crushing a few of my crisps as tears burned in my eyes, but I refused to let them show. The flood of emotions I’d experienced over the past week was becoming too much to all push down at once. As soon as I dealt with certain fears or emotions, others popped up to take their place, like some horrible version of whack-a-mole. Life just wasn’t fair. All I’d wanted to do was return to Scotland and be here for my brother. In that time, I’d been reintroduced to a childhood nightmare, imprisoned in a dungeon, and now I was the prisoner/mate of a werewolf Alpha. When would the roller coaster end? Dougal crossed the space between us in a few long strides. He pulled me from the counter into his arms. New York Times Bestselling Author, Sarah Mäkelä, has received her Bachelor’s degree in Creative Writing. She has been inspired to read and write since reading a collection of her mother’s poetry as a child. Her real passion for writing began after receiving an Excellence in Writing award for a children’s story her seventh-grade English teacher encouraged her to enter for a school contest. Her love of romance novels became evident after picking up her first Harlequin, Chateau of Flowers by Margaret Rome, shortly thereafter. She lives in North Carolina with her husband and cats. 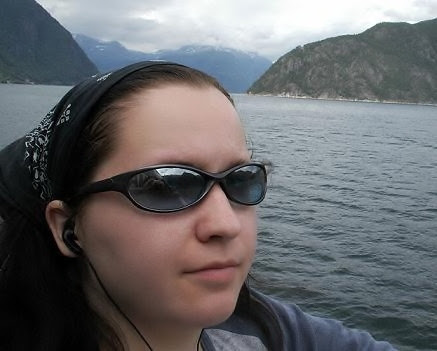 In her spare time, she enjoys reading, computer and console games, and traveling all over the world. She is a member of Romance Writers of America, as well as the Heart of Carolina Romance Writers and the Fantasy, Futuristic, and Paranormal chapters. 1 winner will win a $5 Amazon Gift Card, International. 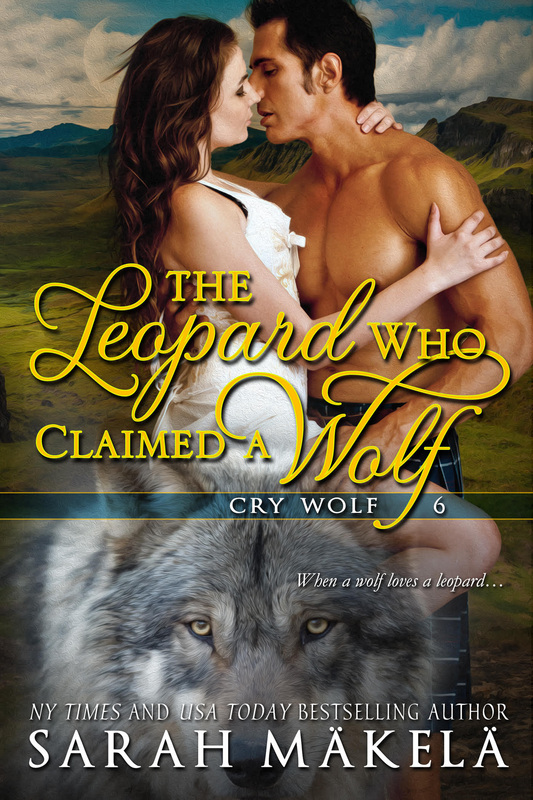 2 winners will win an eBook of THE LEOPARD WHO CLAIMED A WOLF, International. The giveaway will be open until January 22nd at 12:00 a.m. Eastern. Congrats on the new release! Great excerpt. Thanks for sharing.